More than 20 survivors tell their shocking true stories and how they finally managed to get free of toxic relationships, plus offer advice on how to do it yourself. St. Lous, MO – BlissFire Media, LLC announces the publication of a new anthology, compiled and co-authored by certified life coach, narcissistic abuse recovery expert and popular YouTuber Angie Atkinson. For more than a year, Atkinson has been collecting stories from the members of her online support group for narcissistic abuse recovery, nicknamed “the SPANily.” The group’s official name is SPAN: Support for People Affected by Narcissism in toxic relationships. With their permission to publish the stories, the St. Louis County-based YouTuber announced over the weekend that the book is finally ready for release, with the official launch date being set for Friday, November 9. “This book is for every single person, man or woman, who has ever experienced the invalidation, humiliation and soul-sucking proverbial ‘death by a thousand cuts’ that comes with being involved with a toxic narcissist,” she adds. 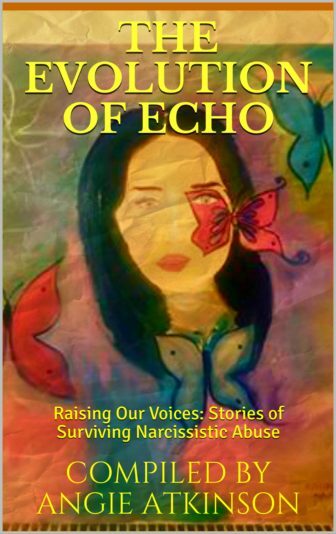 The book, entitled The Evolution of Echo: Raising Our Voices: Stories of Surviving Narcissistic Abuse, features the shocking and inspiring stories of 20 survivors of abuse, plus advice, tips and encouragement for anyone who has experienced a toxic relationship. Authors include Angie Atkinson, Jillian Tindall, Esq., Colleen Brosnan, Lise Colucci, James LaCroix, Andy Maycen, Diane Hawkes, Palma Mingozzi, Rebecca McGranahan, Shermonicia Slaughter, Angelena Lewis, Blair Botelho, Jennifer Primo, Phyllis Gilbert, Lara Shaw, Gable Young, Dita, Nelly Juma, and Dr. Marni H Foderaro. The cover art is an original design by artist and survivor Maria Kauffman, and the anthology coordinator is Melina A. Moutria. To learn more about the book, the authors or to download its media kit, visit http://queenbeeing.com/anthology. To discuss an interview with Angie Atkinson, contact Melina Moutria at melina.a.moutria@gmail.com. Visit Atkinson’s YouTube channel at QueenBeeing.TV or YouTube.com/AngieAtkinson, connect with her on Facebook atFacebook.com/coachangieatkinson or tweet her @angieatkinson.